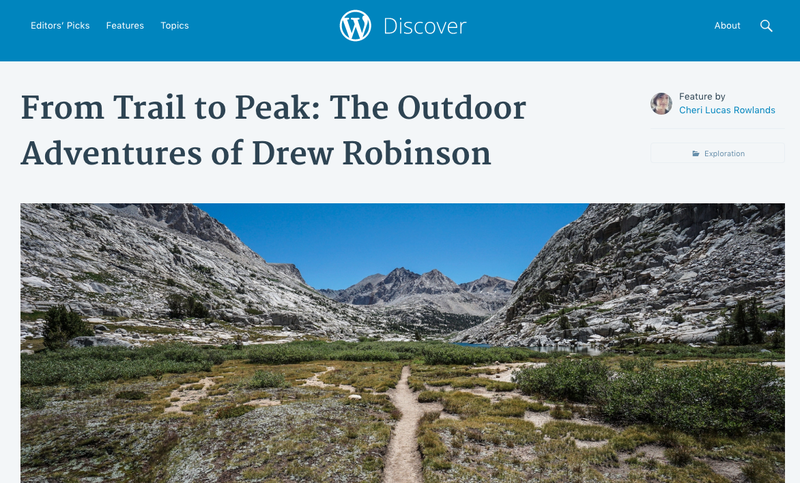 Trail to Peak was recently featured on WordPress Discover! For those of you who are unfamiliar, WordPress Discover is described as “The best content on WordPress, collected for you by humans who love to read.” If you’ve never taken the time to browse the Discover page, I highly suggest you do. It’s a great way to discover and explore great blogs throughout the wide world of WordPress. You can search for editor’s picks and features, or search by topic. This Discover feature post for Trail to Peak is in a Q & A format, which made it a lot of fun. Make sure to take a look at my Discover feature, and explore some of the other great content on Discover while you’re at it! Glad it was – that’s how I found your blog – your photos are amazing!! Thanks, Adam! I appreciate it. It looks like you’ve got a lot of great content on your blog as well! Congratulations, so incredibly well deserved. Your posts are always stunning. Thank you, Miriam! I appreciate it! Well deserved mate! Always a pleasure reading your adventures and seeing your awesome photos. Good stuff! Congratulations! well deserved for such well written and informative posts. Congrats. That’s a big honor and hopefully connected you to lots of new friends. Thank you! It has. It’s been crazy to watch things grow. When I started this blog, it was followed by my family and maybe 5 other people. Now it gets 1000+ views a day with thousands of followers. The blogging community here at WordPress is incredible. I’m glad to be a part of it! Wow. That’s really impressive. Congratulations! Awesome… congrats, Drew! Your acknowledgement is well-deserved! Congrats! Well deserved. I really enjoy reading your blog. Congratulations on being featured on WordPress, Drew! That’s so awesome for you and Trail to Peak. And I didn’t realize you had a baby on the way. Based on how much you clearly love your dogs, I think you will make a wonderful father! Way to go Drew. Outstanding article and superb photos as usual. And congrats on being showcased on Discover WordPress. Your blog is rocking and I say cheers to that! By the way, good to see that good ‘ol Mt Baldy made the cut. Your photo really makes it look special. Thanks, James! I really appreciate it. I just had my first child, a son, this week, so I’m just now getting back onto the blog. Hopefully, I’ll be doing a lot of new posts centered around hiking and backpacking with kids soon. It’s a new avenue for content, and a space that doesn’t seem to have too much written online. The hard thing will be photography. It’s much easier to shoot a mountain than a restless child! Congrats on your first child, Drew! The trails and mountains aren’t going anywhere but hopefully the little one let’s you get out on the trail, now and then. I think you’re right about the hiking and backpacking with kids angle–you just might be trailblazing new territory with that one. Best regards! Thanks, James. The first few weeks have been pretty tiring, but I’m hoping to get back out on the trail in the next week or two! That’s fantastic and – I must agree with he previous commenters – well deserved.